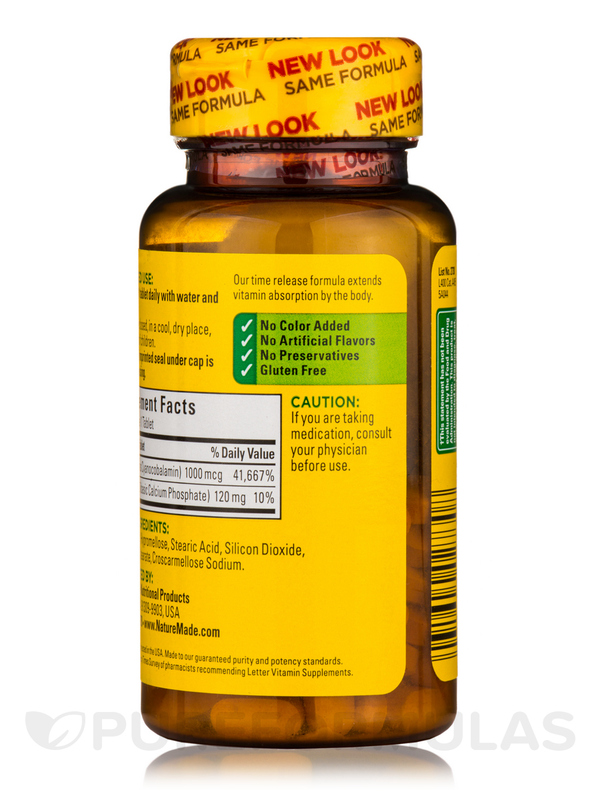 B-12 1000 mcg Timed Release – 75 Tablets from Nature Made® is a gluten-free supplement that enhances your intake of vitamin B12. Vitamin B12 was the last vitamin to be discovered and is present mainly in the liver. 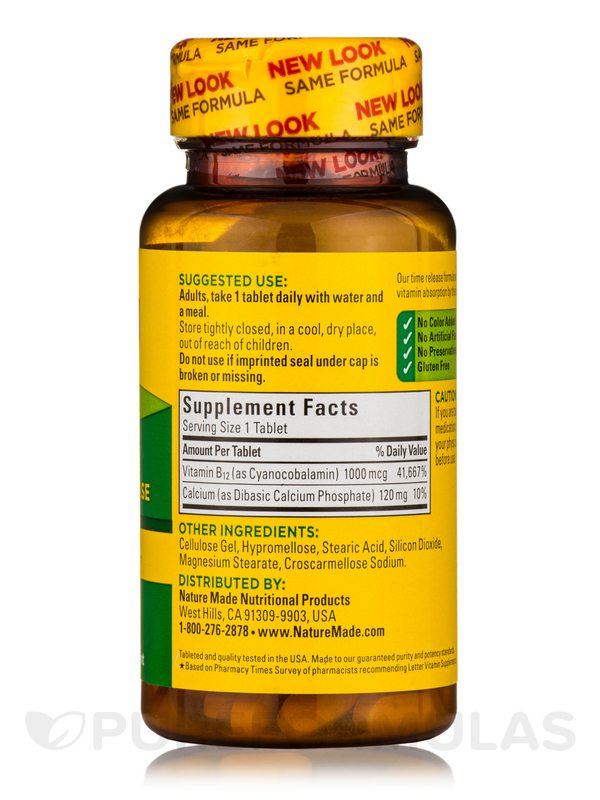 Vitamin B12 present in this supplement from Nature Made® requires sufficient amount of gastric acid and intrinsic factor to bind with. This enables its absorption in the small intestine. Studies reveal that vitamin B12 deficiency may be present in older people due to inadequate gastric acid and intrinsic factors levels. The body requires vitamin B12 for many key functions like cell replication‚ especially red blood cells. Vitamin B12 promotes healthy nerves by protecting the sheath around them. In addition‚ vitamin B12 helps convert food into energy. It helps manufacture DNA and RNA‚ the genetic material in our cells. Vitamin B12 could also fortify the immune system and support the heart by decreasing elevated homocysteine levels. 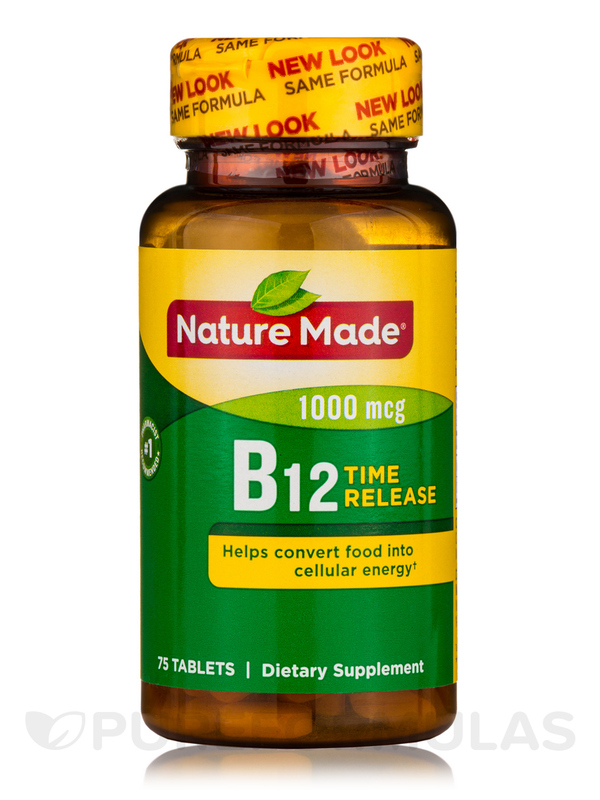 Get B-12 1000 mcg Timed Release – 75 Tablets from Nature Made® and restore balance in your health. Ingredients: Dibasic Calcium Phosphate‚ Stearic Acid‚ Cellulose Gel‚ Magnesium Stearate‚ Cyanocobalamin‚ Croscarmellose Sodium. No Artificial Colors. No Artificial Flavors. No Preservatives. No Yeast. No Starch. No Gluten. Dietary Facts: Vitamin B12 is present in foods of animal origin and in fermented foods where bacteria produce the vitamin. Organ meats such as liver‚ kidney‚ heart and pancreas are the best sources of vitamin B12 followed by clams‚ oysters‚ extra-lean beef‚ seafood‚ eggs‚ milk‚ yogurt‚ chicken‚ cheese‚ and miso (a fermented soybean product). Take one tablet daily‚ with a meal. Current research does not indicate that this vitamin should be avoided when taking prescription drugs. Current research does not indicate that this vitamin should be used with caution when taking prescription drugs.